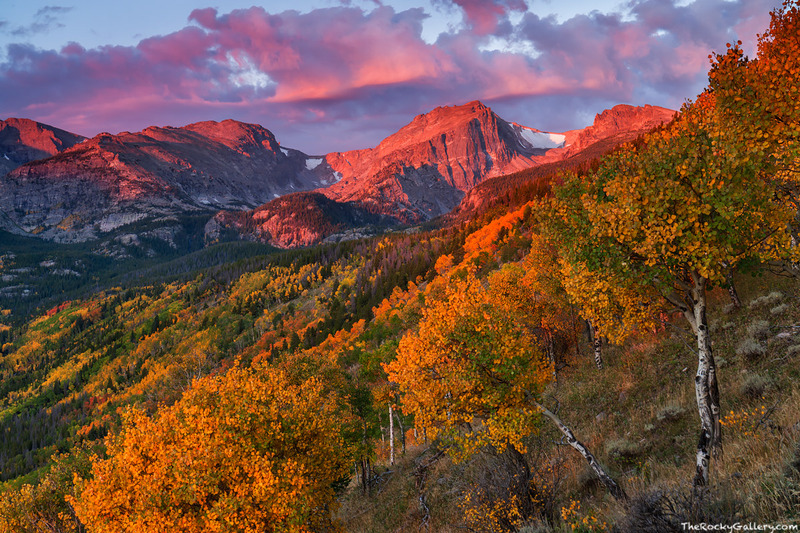 Autumn in Rocky Mountain National Park is special. The park explodes with color as the changing of the seaons beckon. Beautiful Indian Summer like days, trails which are typically free of snow and lakes and tarns still not yet frozen by the grip of winter. All the while waiting in the background is the understanding that all this incredible beauty and color will soon lose out to the grip of winter. Fall in Rocky comes and goes in the blink of an eye or so it seems. Photography this time of year while rewarding can be frenetic and fast paced. There is never enough time to capture all the beauty this time of year and one often is wishing they could be in multiple locations all at the same time. This morning on the Bierstadt Moraine high above Bear Lake Road there was no other place I would have liked to have been. While I've spent many autumn mornings photographing on the Bierstadt Moraine, this was one of the most memorable. When I hiked up to this location the skies were clear. Right before sunrise, clouds began to move over the divide and Otis, Hallett and Flattop Mountain in the distance. The colors at sunrise were nothing short of spectacular and this is one of my most memorable mornings I've spent photographing Rocky Mountain National Park. Photo © copyright by Thomas Mangan.